The Coast Starlight, pride of the Amtrak fleet, plies the California coastline on a daily basis. This panorama shot was taken in October 2009, as the train stopped for refueling and refreshing. I'll admit that I'm a bit of a train buff. Once a year, I plan a trip around the country. Sometimes I begin in Chicago, and sometimes things get their start in Newton, Kansas. The journeys usually take ten to twelve days... Just me, on a train, with my camera equipment, and a notepad to record my journeys... Well, actually, the notepad is my laptop. Train journeys are a great adventure, and for me an excellent way to decompress, and take a bunch of photos. Photography on a train can be a bit twichy; however, if you have a good camera, and understand the process, you can get some pretty impressive shots. These images are just a few of the thousands of images I've shot from a moving train. If you're interested in reading a photojournalist's impressions of riding the rails, just go to the following site, and click on the journeys. In addition, I've created illustrations of the Amtrak cars, and have some tips and tricks for riding, and photographing on a train. 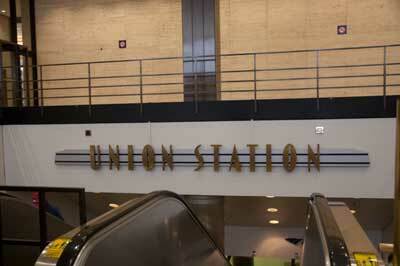 The entranceway into Chicago's Union Station beckons travelers with its Art Deco look. 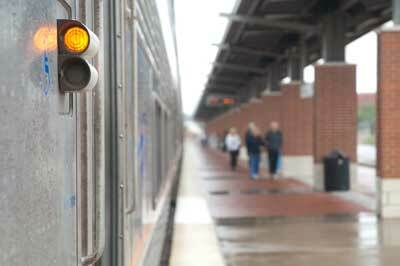 The signal light on an Amtrak sleeper car lets the conductor know that everything's okay... or not. 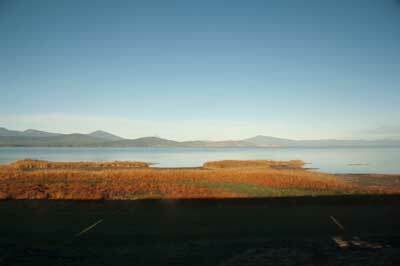 The Coast Starlight moves north, up the California coast and heads into Oregon, on a cold October morning. The Empire Builder travels across the top of the United States from Seattle to Chicago. 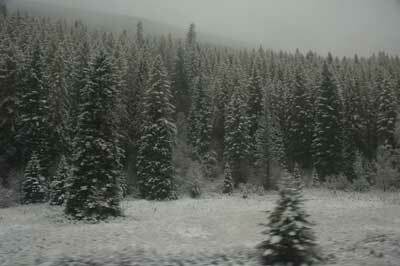 These trees in Glacier National park are covered with a dusting of early Winter snow.